is to develop a strong concept. Visual images can be a powerful selling tool, but not all visual images. Some are spectacular in their marketing power, others are little more than pretty pictures, nice but quickly forgotten. Powerful images stick in people's heads. I've had some experience with powerful images. I've seen one photo produce $100,000 in sales; another more than a million. But the key to it was getting the right image for the context in which it was to be used. These shots involved a bit of luck. But the luck itself came about by setting up the setting in which the lucky shot could be grabbed. If you are looking for strong images to sell perfume, your first step is to work up a strong visual concept. This is like outlining a plot for a book, film or TV show except that it will be an outline for one frozen moment. As you develop your concept, keep several points in mind. Most important is the image that you want to create. What will be the best image to hook viewers on an emotional level, pushing them toward a purchase? Also keep in mind your resources. A good idea is no good to you unless you can produce the image you've imagined. Models who are unavailable to you, or you can't afford to hire, or who will never be good in front of a camera have to be ruled out. Locations you can't afford must be rules out. Sets that you can't set up properly must be ruled out. Your great concept has to be one you can execute. Photographing your great concept should not be a static exercise. Yes, take the "art director" shot, the one you sketched on paper for your layout. And keep your layout in mind, the space the photo must fit. I can recall a time when I wanted to shoot jewelry on a model. You get a quick lesson in proportion. The model is large, the earring is small. You want to show the earring large because that's the product. The model's face gets cropped. So why, tell me why, was casting for a face when it should have been for an ear? Now comes the fun part where you are most likely to get a shot that moves people. Loosen up a bit. Go a bit crazy with the camera. If you're working with a model or models, have them loosen up and go a bit crazy. Overdo it. Then cut it back just slightly. This is where you're likely to get images that move people. The image above is not a great example of an advertising shot but let me walk you through its creation. Having just written about the importance of TEXT, I wanted to follow up with an article on the power of images. In producing this article it seemed strange not to have an illustration so I decided to cook one up. This would be a simple image using props on hand and a "model" who was sleeping on the couch next to my desk. Since this blog is about marketing your own perfume, A bottle of perfume was called into service, Moonfaire in this case. 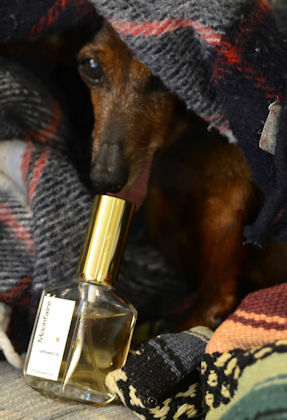 Then, to add human interest, I posed Kissy, a miniature dachshund, with the bottle. Now it was just a few snaps and a bit of photo editing and I was done. No, the image isn't powerful. It just demonstrates how you can put a concept together. A few final words on images. Few images have much meaning standing alone without a headline, photo caption, or a context. When you use a photo, make sure you've given it the support that can make it's message clear -- and powerful. You'll be amazed by how a few added words can multiply the power a photo. An article in our Perfume Strategies newsletter from June discussed recent evidence that most social network postings that are shared have never been read by the person doing the sharing. In that issue I wrote about how you can take advantage of this quirk. If people share a post without reading it clearly it is the immediate impression of the post that has triggered their share. So, if you want your post shared, you have to work on that first impression. But some people do read posts. So if your content is your selling story, you don’t want to weaken that story just to get more shares. The all important trigger is the headline; if there is only a photo, the photo caption; if there is only a video, the first frame of the video, the one that you see behind the "play" button. Very few photos communicate a message (a real message!) fast and clear without the addition of a (text) caption. Video almost never communicates a coherent message with that single, frozen, "waiting for the play button to be pushed" first frame. Text -- a headline -- can capture attention and communicate real meaning in just a few words ... which the eye and brain can process in microseconds. That's why headlines have always been so important in communications whether they be news, advertising, so social. In spite of what the promoters of video want you to believe, the written word is still king. First, try to condense the essence of your message into five or six words. This also helps you focus on what it is that you want to communicate. Then pull out, in two or three words, the most exciting, sharable point in your message. Now artfully blend these elements in a single headline or photo caption. Step back. Let it cool for an hour or two, then look at your headline again. Did you nail it? If so, go ahead and post. If not, work at it some more. Good communications are worth the extra effort and you will get more shares. NOTE: Every month I discuss issues and strategies of importance to marketers in our Perfume Strategies newsletter, free to members of our Perfume Makers' Club.